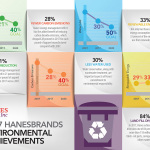 WINSTON-SALEM, N.C.--(BUSINESS WIRE)--HanesBrands (NYSE: HBI), a socially responsible, leading marketer of everyday basic innerwear and activewear apparel under world-class brands in the Americas, Europe and Asia-Pacific, today released the company’s 2017 environmental performance. Across every category, the company posted strong results compared to the year prior. Versus 2016, Hanes reduced its carbon dioxide emissions by 15 percent, energy use by 6 percent and water use by 7 percent, while increasing its use of renewable energy by 7 percent. Additionally, Hanes – unique in the apparel industry because it owns the significant majority of its manufacturing and supply chain operations – again diverted 84 percent of its supply chain waste from landfills. Water use by 50 percent (30 percent). Hanes has also pledged to secure at least 40 percent of its energy from renewable sources (33 percent in 2017) and achieve zero waste by diverting company-owned supply chain waste from landfills (84 percent). Faircloth was named a finalist in Ethical Corporation’s Responsible Business Awards for the 2017 Sustainability Leader of the Year, and the company’s Energy Treasure Hunts program was also recognized by the organization for Employee Engagement of the Year. For eight consecutive years, Hanes has won the U.S. Environmental Protection Agency Energy Star Sustained Excellence/Partner of the Year award – the only apparel company to earn Sustained Excellence honors. The company ranks No. 194 on Newsweek magazine's green list of 500 largest U.S. companies for environmental achievement. 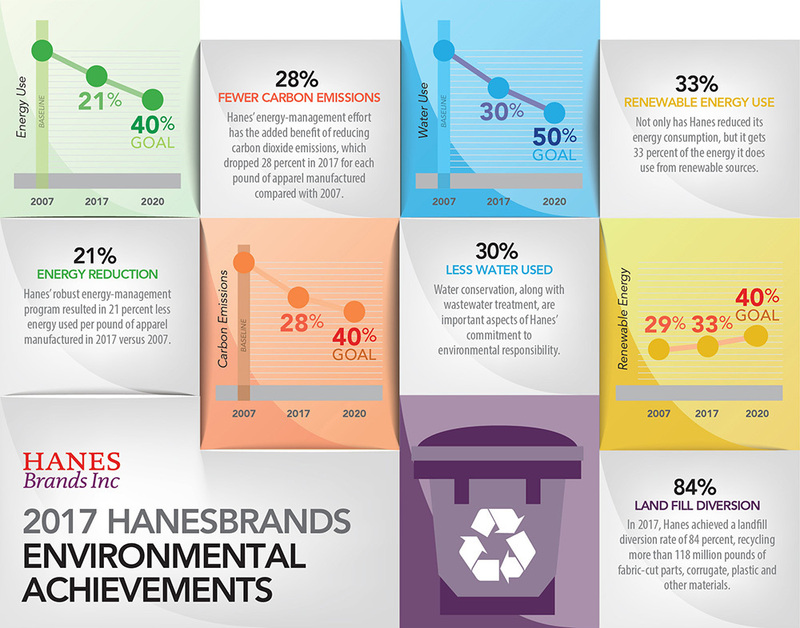 For more information on HanesBrands’ award-winning environmental sustainability efforts, visit www.HanesForGood.com.